It has been far longer than i had realized, since last i posted here. I’m sure you all thought this blog was dead! For a time i suppose it was. Since last i posted i was inducted into the Daughters of the Sacred Grail, a women’s Avalonian group. During which i had a vision of the Horned Hunter. And earlier this year my partner and i were able to conceive a little girl. As i write i am 8 months and one week pregnant. However, today i’m not here to write about my little one (you’d be surprised but one does get tired of talking about their spawnling) During this period i took off from the blog, i began to study the “Bee Mysteries” so to speak. The past is full of priestesses who were devotees of Bee Goddesses. The topic has interested me every since seeing the remake of The Wickerman. But as of late my path has been heading in a totally different, or rather parallel, direction too Bee Priestesshood. This has left me a bit lost and confused. I kept receiving indicators,messages if you will, on a totally different wavelength. My road seems to be dipping down below the normal road of service and ritual. Deep down into the darkness of the Unseen places. I was and am being lead down the low road. Or at least the Low Road has been made available for my travel. But, again this left me confused and a tad disappointed in my self. I have been championing the Bee Path for over a year now, and it seems to not be part of this new direction…or old direction depending on how i look at it. So, in hopes of divining where i’m going with all this, the past few full moons i’ve been working to figure this out in the Otherworld. All things start there and eventually manifest here, so it the best place to get direct answers. Last months whilst on the Holy Isle i became and old woman. A Hag in looks. I was shown an owl and a young child playing in a garden. I filed these things away for safe keeping in my mind. Still not satisfied, this month i sought out Dame Ragnell Her self. The Lady Ragnell and i have a history together. I assume, since she seeks me out in this world and the Other, that she is my Matron goddess. 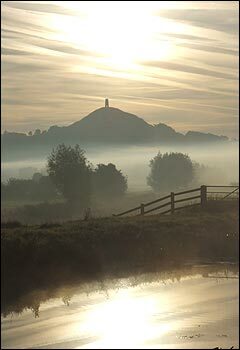 Last night i sought her under the hill in Glastonbury. Deep down in the widdershin world. The Horned Hunter ushered me to the Otherworld in his barge small white candles hanging from the tines of his deer horns. He asked me what i came to seek and i told him three times. He simply nodded and offered me his hand then helped me off the barge on the other side. From there i made my way,with purpose, too the Tor At the top I found a sort of trap door that i entered and began my decent via widdershin stares. Once i reach the bottom waiting for me was Dame Ragnell with her stark white hair and ancient face. I sat before her and watched her gnarled old hands spin her hair into thread on a bottom whirl drop spindle. In short order i told her of my trials, of my worry over the Bee Path, and not understanding the direction i’m going. She listened, but only grunted now and then to indicate her listing, or perhaps to punctuate something i was not grasping. When i was spent and had said everything i could think to say, she looked up from her spindle into my eyes. Again, as in times before, Her face would flash from old and ugly to vibrant and beautiful in a puff of smoke. Her eyes turning from beady and black to bright blue. Do i know for sure what these things mean? I’m not positive, but i have a good idea. Reflecting back on my phraseology when telling Her of my worries, yes i think i understand her answer. My path is simplistically complicated. I have been looking at the parts and not the underlying current. My road is that of service, but i will always be beside and underneath what most people see. Mine is the way of the old Owlfolk, walker between places. What does this mean for the whole Bee Priestesshood, i’m not yet sure. But at least now i know where North is.